5 Star Studio Condo with water views! Walk to pool, hot tub, and 1000 ft fishing pier! The Heron Room is located in the completely remodeled Laguna Reef Condominiums and is the perfect place to spend some quality time away from home. 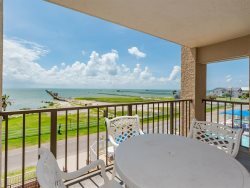 Soak up the sun in the swimming pool, fish off the 1000 foot lighted fishing pier, or simply enjoy the view from the patio. This ground floor room has a king size bed and love seat size sleeper sofa perfect for the kiddos. The Heron Room also offers free internet and cable television. There is a dresser and small table with seating for two along with a mini fridge/freezer, microwave, and coffee maker. Enjoy the beautiful decor throughout the room and the spacious bathroom with a tub/shower combo as well. If you have a larger group, The Heron Room is adjoined with Gone Fishing, Unit 117. They can be rented together. Please give us a call to inquire if you are interested in both rooms. The doors are very secure and NO ONE can enter into either room unless we give the access. The Heron Room is perfectly located right across from the pool and hot tub and has gorgeous water views. Amenities at the Laguna Reef facility include a swimming pool, hot tub, 1000 ft. fishing pier with fishing lights, several shared charcoal grills, beautiful grounds on the water, and a large parking lot with plenty of space. The Heron Room is located near the Rockport Heritage District and Rockport Beach. Spend a day in the sun at the Rockport Beach where you can rent jet skis, swim with the kids, or grill up some food at one of the picnic areas. The Rockport Beach also allows fishing and is only five dollars for a day pass or 20 dollars for a year pass. There are two piers at the Rockport Beach, the south pier is free and the north pier has a beach admission fee. There is also a boat ramp. We have a list of fishing guides on our site as well. The Heron Room is waiting for you!